Imagine a cross between a moist, chewy brownie and a chocolate chip cookie. That’s what these blondies taste like! You’re likely to always have the ingredients on hand in your pantry, hence the name. The original recipe called for walnuts, but I replaced them with chocolate chips. If I wasn’t the only one around here who likes nuts, I’d probably use both! I have a fantastic brownie recipe that is mixed up in a similar fashion, stirring the sugar into the melted butter, etc. so I knew these would be good the minute I read the recipe. I usually make a double batch, so there is a half a pan for me, and half for everyone else. Melt the butter in a large saucepan over low heat; remove from heat. Alternately, butter can be melted in a microwaveable bowl. Stir brown sugar into melted butter until it is dissolved. Quickly whisk in the egg and vanilla. Stir in the flour mixture until just incorporated. Stir in chocolate chips. Spread the batter into the prepared baking pan. Bake for 25-30 minutes. Who Dished It Up First : This recipe was originally published in Mom’s Big Book of Baking, but I found it at Whipped. 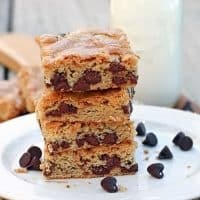 It seems everywhere I look someone’s making blondies these days! This looks delicious! I want to grab one from my screen! Yummy! These look so good! I posted a snickerdoodle blondie recipe that was super good you should check out. Thanks for giving me another great blondie recipe to try! these look just up my husband’s alley…. might just whip up a batch this afternoon. My husband hates blonde brownies, but he liked these. we thought we would cut down on the amount of chocolate chips next time, but other than that…great! 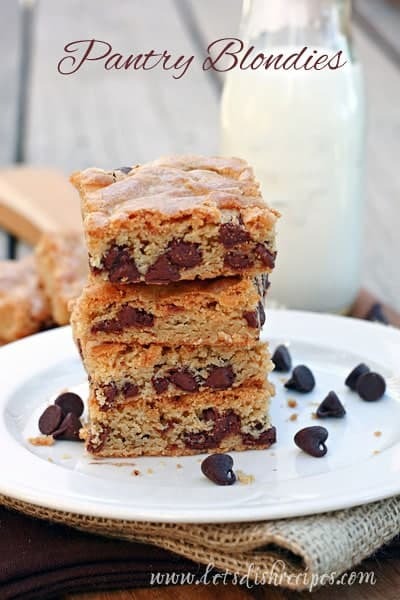 These look incredible..I have been looking for a blondie recipe!! I’m baking these right now. It looks so good ! These were wonderful! I’m sharing them and linking back to you on Dr. Laura’s Tasty Tuesday this week! Thumbs up on pantry blondes. Easy and tasty! Are your baking recipes adapted for high altitude baking? If so, I look forward to trying them. This has been my go to dessert when I need one quick. I always have the ingredients in my pantry (perfect name) and I get loads of compliments when take them somewhere.